Slate tiles are indigenous to several regions of France (Anjou, Loire Valley, Ardennes, Brittany, Savoie) making them plentiful and affordable over the centuries. 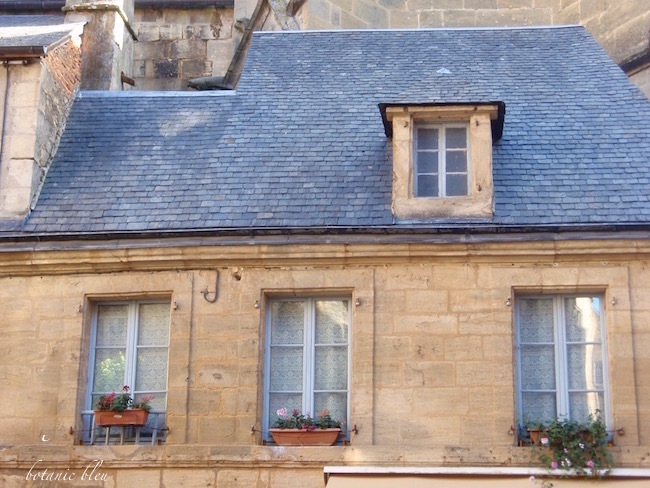 Take a look at the photo above of a house in Sarlat, France. Not a château, but a large house in a small town. Dark blue charcoal flat slate tiles blend well with cream-colored stones and the window-trim paint color, French Bleu. 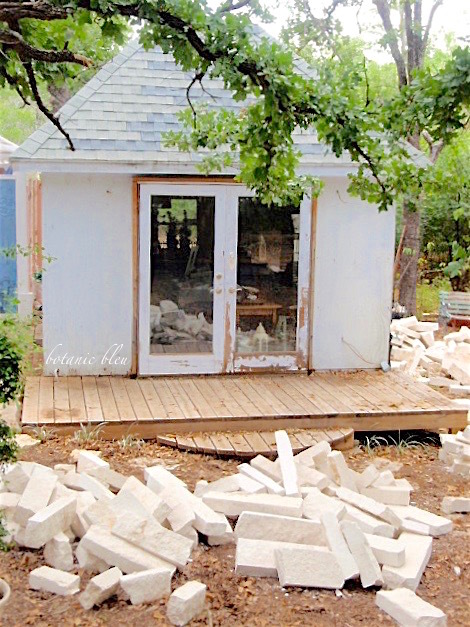 When designing our DIY garden shed for our back yard, I wanted a French-inspired style. Slate tiles for the roof were not in the budget. Not to mention that a blue slate garden shed roof would be more elegant than our house roof. The garden shed has been built over several years, going on ten years now. This photo shows the budget-friendly asphalt shingle roof in 2014 when the white cut stones were being added to the exterior walls. We bought the shingles from a local roofing company. I wanted a blue shingle roof that resembled blue slate roofs in France. We decided to use two colors of shingles, blue and pale green-gray, for three reasons. Multiple shades give the roof some depth. The roofing company did not have enough bundles of the blue shingles for the entire roof. We either had to use another color for the entire roof or mix colors on the roof. The green-gray shingles give an illusion of moss which sometimes grows on older roofs. I like the mix of the two colors more as time passes, partly because the colors of the shingles have faded making them blend together more. Creating a French-inspired design does not require strict interpretation or replication. Study photos from magazines, blogs, catalogs, travel brochures, and Pinterest for ideas about what appeals to you about French design, like a blue slate roof. 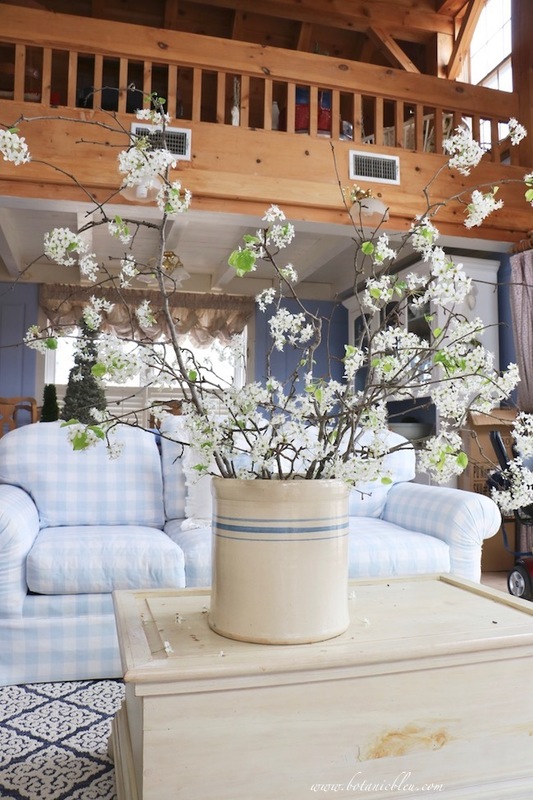 Then use materials readily available to interpret that look for your home. Use the exact materials if your budget allows, but with a little creativity and planning, alternative materials may also give you the French design you like. Good design does not require expensive materials. Good design does require quality materials. Come back each Friday in 2017 for another post in a design series that shows 1] a photo taken in France that illustrates French design and 2] how that design translates into our homes, even on a budget. What tips can you give for using budget-friendly alternative materials to create French style? 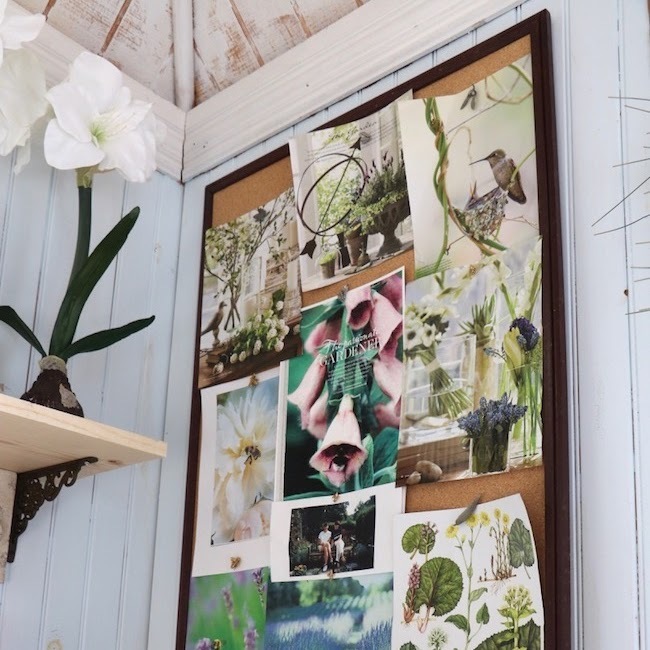 Read more about the garden shed. 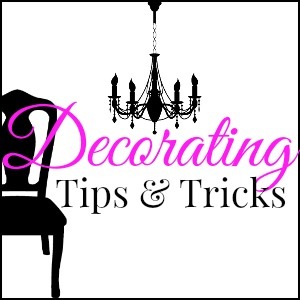 Want to learn more Decorating Tips and Tricks? 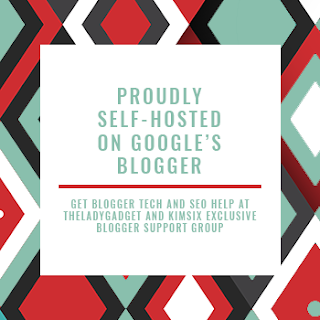 Three of my good blogging friends, Yvonne of Stone Gable, Anita of Cedarhill Farmhouse, and Kelly of My Soulful Home, are superstars of decorating, and they have launched a new podcast beginning February 1, 2017. Here's where to find the new podcast Decorating Tips and Tricks. Maybe they will ask me to be a guest on their podcast one day to discuss French design. 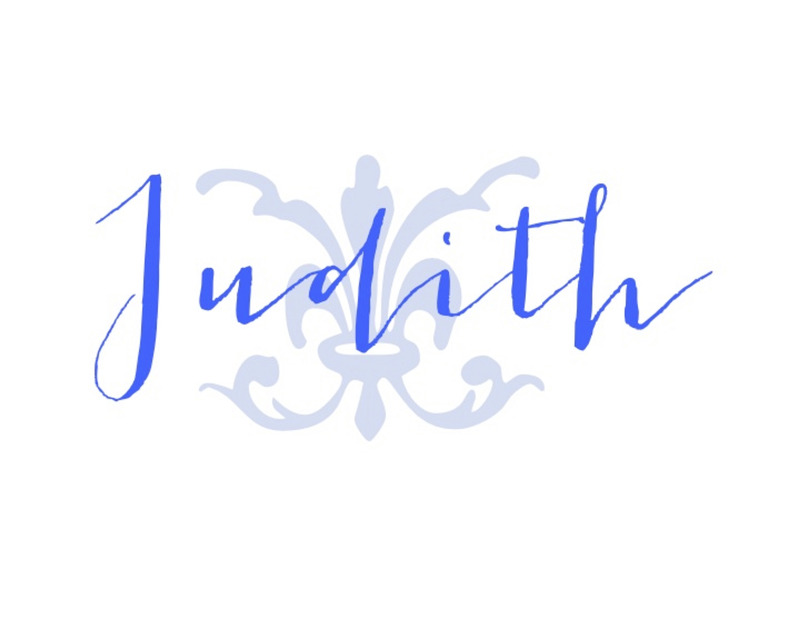 Love your petit French garden shed, Judith! A French influence whether it be a touch here and there, or a dedicated lifestyle by design is so romantic. You are one of my favorite "designing woman" because of your passion and attention to detail. I am easing myself back into the groove of blogging once again! It took me way too long to get my "reader" going! What a winning combination of shingles to mimic the French style on your garden shed, Judith! You can imagine how stunned I was to see a neighbor on our street replacing a beautiful slate tile roof on an established brick home with......get this......a metal roof. There's a place and architecture intended for a metal roof, and it's totally out of sync with this particular home and neighborhood. I love your garden shed and I think your combination of shingles is genius! As you know, the Texas summers are brutal and keeping potted flowers fresh is nearly impossible with the deadly combination of high temperatures and drought. 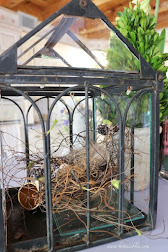 I picked up a trick from a floral designer - augment your flowering pots with high quality silks. 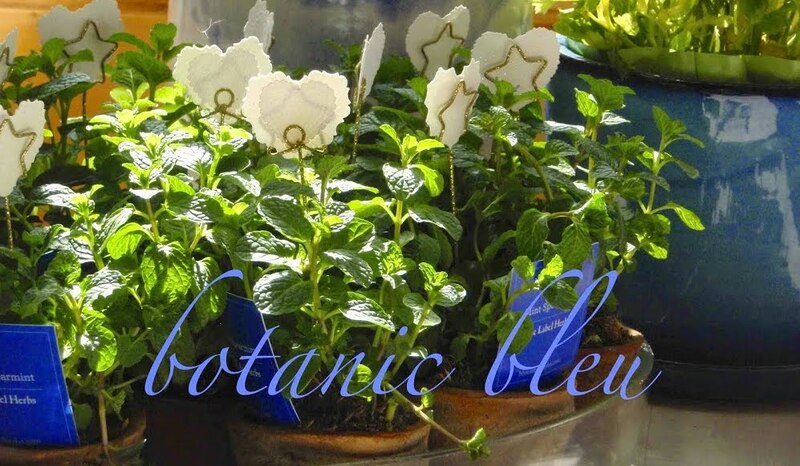 Sometimes as little as 3 silk flowers tucked into the pot( 2 on the sides, 1 in back) can perk up the appearance of the entire pot. 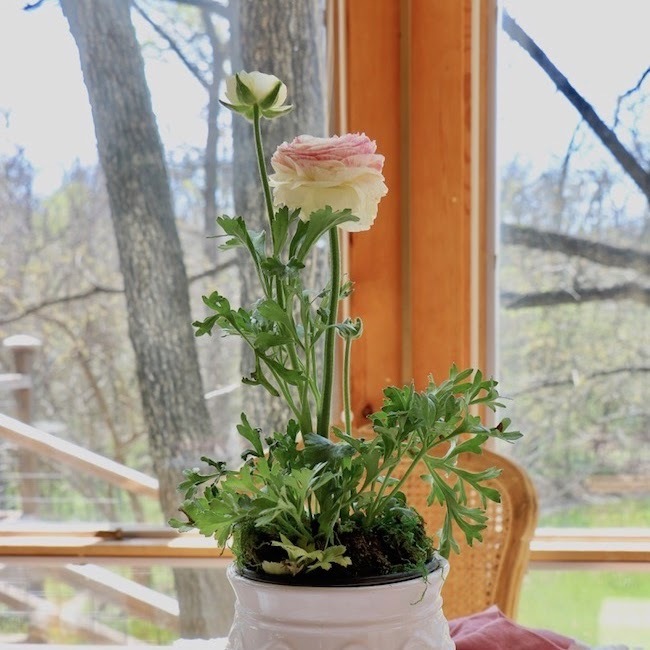 I grow geraniums in large pots outside that bloom year round. You can be sure that in August I've got a couple of silks peaking out the sides! 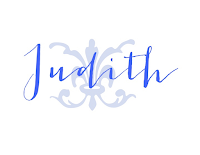 Judith, I love this new Friday feature. Thanks for all the french design tips. I have slate floors on my porches and now recognize their lovely patina. When we first bought our home I looked into replacing them because they were not perfect. Glad it was too costly and that I have learned to appreciate the charm of weathering. How nice to have a garden shed. I must look up your archives and see the inside. What a beautiful post!! Thanks so much for taking the time to visit!! 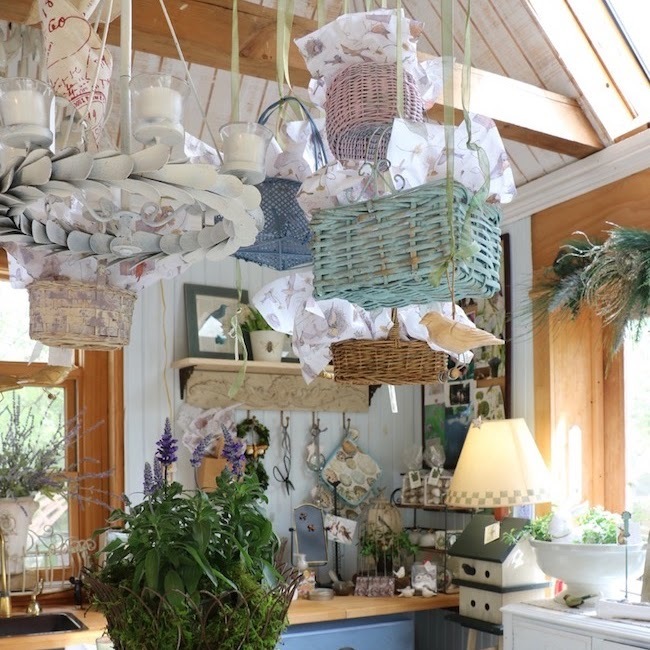 I love your French garden shed! 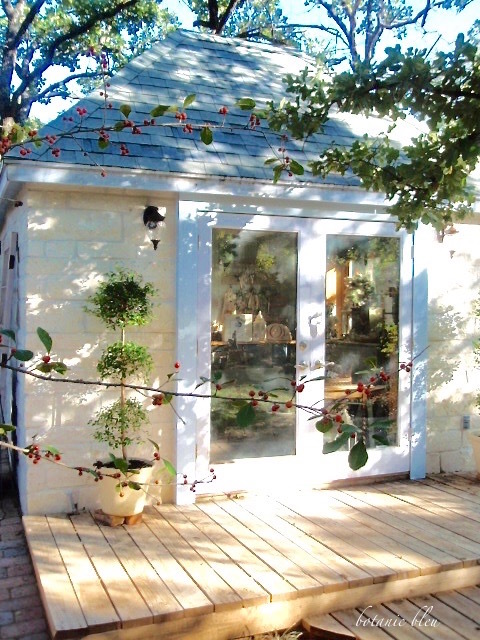 Your garden shed looks very French even though it does not have the costly slate roof. Agreed, good design can be done without spending a $$$, and expensive designs do not always mean they are good! I love your style and your thinking! The thought you put into every detail is the reason your home is so beautiful. I love this post. So informative! I love your decision of using the three colors on the roof. I love your garden shed! I have always loved your beautiful garden shed. It looks just amazing! Maybe someday!